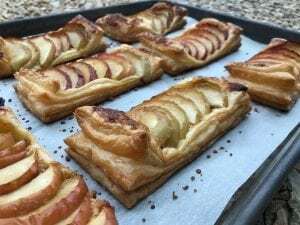 We’ve been in the kitchen today baking little apple frangipane tarts for some special guests this afternoon (hint: for our visiting Western Australian distributors, Blue Cow). 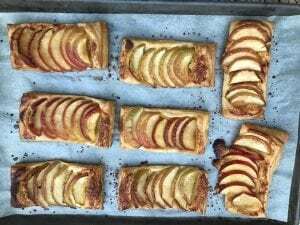 Rather than using our sweet vanilla bean pastry for this recipe, like we did on these apple frangipanes, we’ve used our puff pastry – both our classic butter puff pastry and our spelt wholemeal puff pastry. If only you could smell the aromas coming from the oven right now! We thought you might want to give these a go yourself, so here’s the method. Enjoy! • Beat 110g caster sugar with 100g butter until pale. • Add 1 egg, beat until just combined. • Add 100g ground almond meal, tsp cornflour, pinch salt, mix until combined. • Cut 10 rectangles from a sheet of pastry. • Top each with a teaspoon of frangipane. 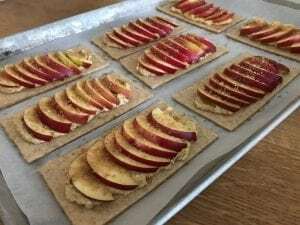 • Slice 6 apples into thick (1/2 cm) slices, and place on top of frangipane. • Brush apple with melted butter, then sprinkle with Demerara sugar. • Bake at 220c for 10 minutes, then reduce oven to 190c and continue to bake for 10 to 15 minutes or until pastry is golden. The spelt puff tarts ready for the oven. Voilà! The finished spelt butter puff tarts. And the finished classic butter puff tarts.